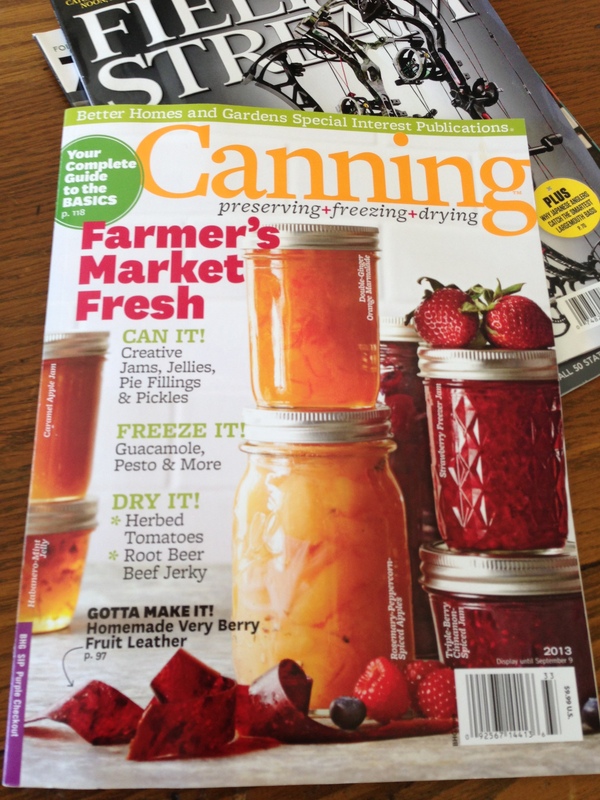 I was in awe of how my limited jam and jelly efforts are/were compared to the world opened up in this issue. I am not including recipes – US folks can probably find this issue, if you can’t send me a request and I will accommodate y’all. Jams were next and I saw some very mouth watering combinations. I have a vision of returning to Houston and creating some amazing Jellies and Jams. I am on a garden break and my son’s good friend and former teammate is keeping the greenery alive and hopefully enjoying some of the bounty…..the long extended heat wave in our area has slowed a lot of my harvest. Old faithful cucumbers should overwhelm him….as long as he keeps them irrigated! My return at the end of July may include a hunt for some Fredericksburg Peaches! 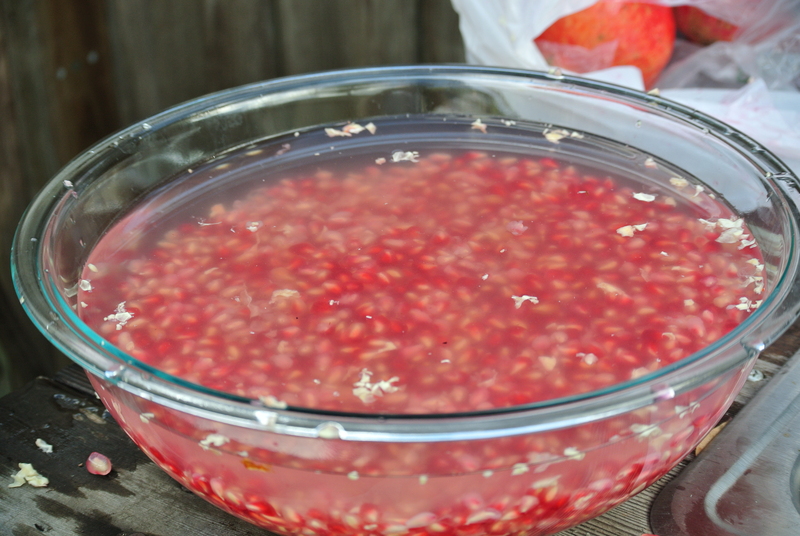 One of my favorite jellies is Pomegranate and more specifically that made by my Aunt Josie. Her husband, my Dad’s brother, Uncle Jim, worked for Western Water Works in Taft, CA. 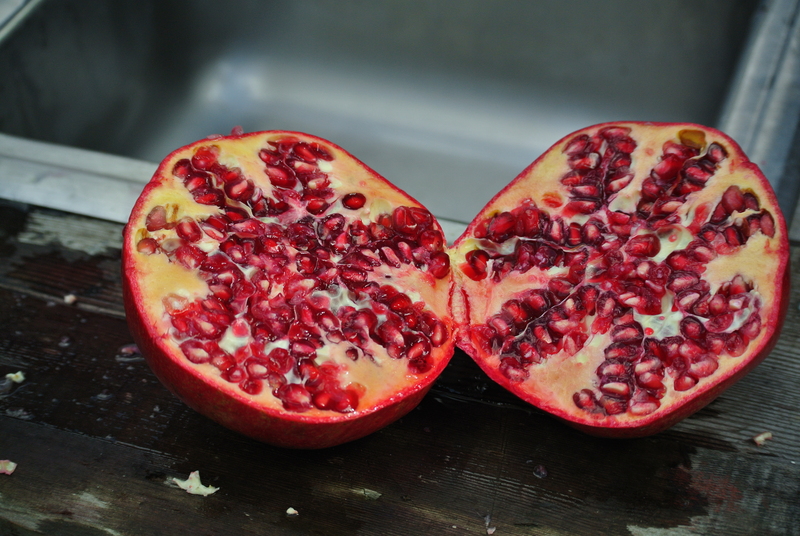 The equipment yards were fenced and ringed with pomegranate trees. They didn’t grow very tall but were loaded with juicy fruit every fall. 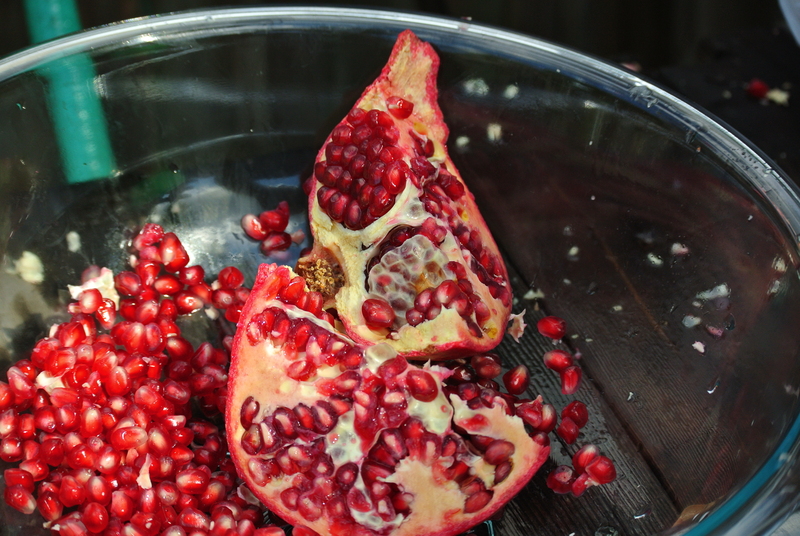 The word pomegranate is an apt description – “seeded apple” – and by golly, tons of seeds. After my efforts to make pomegranate jelly the hard way I have a lot more respect for the effort and love my Aunt put into making that wonderful jelly she handed out around Christmas each year. To address my wife’s concern about costs – $ 20.00 for pomegranates, $ 3.00 for the Sure – Jell low sugar pectin, 5 cups of sugar about $ 4.00, lemon juice less than a dollar. About $ 28.00 for a batch. Let’s not consider my labor costs, it is a labor of love, just like my love for my wife …… priceless! Commercial pomegranate Jelly – somewhere between $ 7.00 to $ 13.00 per jar ~ 8 ounces. My jelly is in that cost range, only better because I made it!!!!! I was smart enough to use my outdoor potting bench and sink set-up to extract the seeds. It is a messy mess. 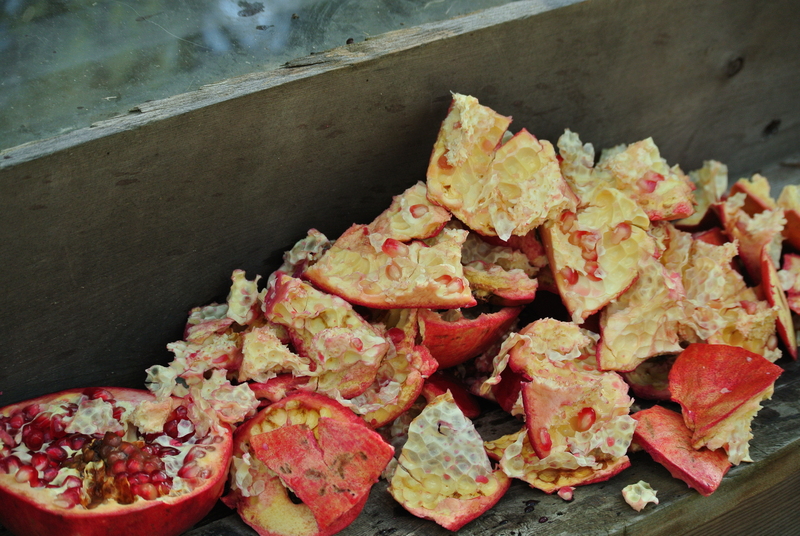 As I worked through the extraction process I actually became more proficient in the process. The methods I found on the internet search did not help much at all. See the process below. The next step is to break it apart. If done well, and that is a bit of a learning experience, it makes the removal of the kernels easy. If not it is a B……….! Broken open and the sweet kernels on display in a bowl sloooooowly becoming full. The sink comes in handy to rinse my hands off and to rinse the kernels. The white membrane like material floats and the kernels sink making it relatively easy to separate the good stuff from the chaff. The bowl with kernels on the bottom and the chaff floating on top of the water. Makes it easy to segregate the good stuff from the trash. The trash….oh my, it is quite a bit, but it is all destined for the compost bin. Hopefully it breaks down fairly quick! About halfway through the effort! Lots of trash. Next is the extraction of the juice. I dumped the seeds into a pot, added a little water and heated it all to the boiling point. I used a potato masher and then ran the mix through my food mill. The juice is a bit murky after sieving and filtering. I have it siting in the fridge to clarify a bit before making the jelly some time today. More on that later. Can’t hardly wait to sample the results…..To my cousin Drew….I will send you a jar!